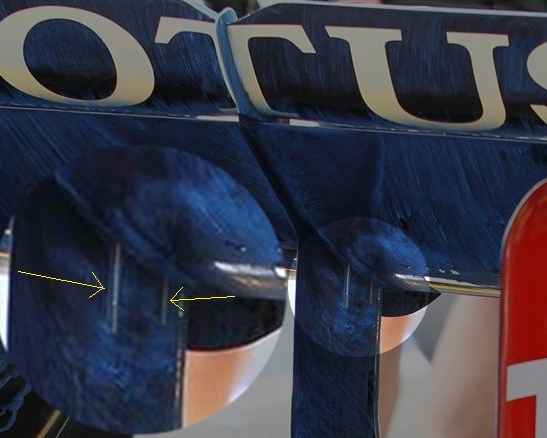 You may well have already read my previous article on my feelings regarding the Lotus DDRS system http://somersf1.blogspot.co.uk/2012/07/lotus-e20-ddrs-hockenheim.html, as always the problem with not being able to see these items in the flesh leaves doubt over their actual purpose. As more images have become available it's become clearer that my original thoughts on the system although perfectly valid and usable are actually flawed. The trouble with fluidic switching systems is that there are so many ways in which you can move air from one location to another that the waters muddy. 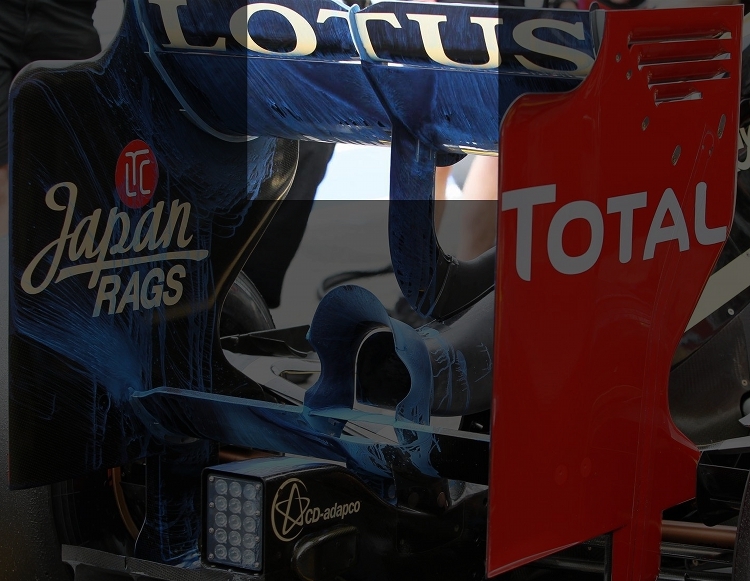 Compounding this, Lotus had already stated that their system utilises the same loophole that the Mercedes DDRS system works within (ie using the DRS movement as a part of the flow adjustment for another device). It is plausible that is a Red Herring with the addition of the periscope simply acting as it's own device reducing drag by blowing the underside of the Rear Wing's main plane reducing drag passively above a certain speed threshold and then when DRS is activated it simply augments the DRS effect. I'll explain this first and then go on to explain how both this theory and my original one could be combined. As we can see in the images above small slots in the periscope blow the central section of the main plane reducing drag in that region of the wing. (Flow Viz is splayed in this region denoting the reduction in drag) This concept mimics the original F Duct principles in how drag is reduced on the rear wing but falls short of being as powerful. The original F Ducts had much larger slots on the rear wing plane in order for the drag to be reduced over a larger area. The original F Duct also required the driver to act as a switch effectively turning on or off the rear wing, this was outlawed as part of the regulation change back in 2011. The Lotus system is instead tuned to reduce drag at a certain speed by specifically designing the engine cooling outlet. At lower speeds the air consumed by the airbox inlet and ear ducts can escape through the engine cover cooling exit. As the car reaches higher speeds the air consumed becomes more than can be effectively exhausted from the cooling exit and so air spills up the periscope toward the rear wing reducing drag on the lower wing plane. The rules were amended at the end of 2010 to stop the interaction of shark fin engine covers with the wing planes and DRS was introduced in response to the teams drive to reduce drag and increase overtaking. With DRS now moving the whole top element creating a union with the engine cover would obviously be very difficult anyway. The periscope however doesn't join to the wing frontally but on the underside and so circumnavigates this rule. Using the periscope to blow the bottom wing plane allows a dual drag reduction system with the lower plane being blown as soon as the car reaches a pre determined speed and DRS obviously adding the larger drag reduction element as and when it's activated. Passive F Ducting to the rear wing will provide a marginal advantage during qualifying where DRS is unlimited simply boosting the DRS effect but it's during the race where the system should give Lotus the largest advantage. On circuits like Spa and Monza they will be able to increase their wing angle of attack creating more downforce during cornering and have less drag on the straights than their counterparts where DRS is unavailable. 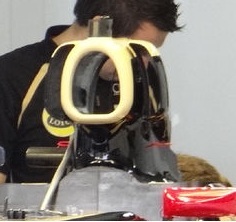 Although McLaren were the first to introduce the F Duct in 2010 it's widely regarded that once integrated that the Renault team (now Lotus) had the most effective F Duct system. This obviously puts them in great stead in terms of understanding how best to utilise such devices. 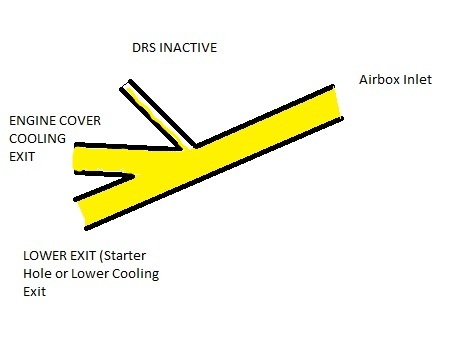 The problem with a passive system over a controlled system (like the original F Duct) is that the system is very much dependent on airspeed through the airbox. This may cause problems in the form of tunabilty especially when we consider the difference between the ability of a car during qualifying with a low fuel load and that of a car full of fuel. We also have to consider the high speed nature of circuits like Spa and Monza have corners with high speed exits and so reducing drag on corner exit as the passive duct inadvertly activates could be catastophic. This means that the Periscope Duct needs to be tuned to activate at a relatively high speed and as such won't have the same drag reduction capability the older F Duct did. If we take the team at their word that the system employs the DRS as a lever to leverage another element in the system I believe that both variants of my thoughts could be in play. The problem with this is that we are yet to see a close image of the DRS open in order to establish if the wing covers any holes in the wing plane. This would work by exhausting the airflow from the airbox inlet through the cooling hole and as it the exit becomes too small for the airflow exiting the air moves up the periscope and reduces the drag on a portion of the lower wing plane. When DRS is activated and a hole is opened on the rear wing plane a more positive draw would be created on the airflow from the airbox inlet drawing more air up the periscope and out of the slots. This would increase the effectiveness of drag reduction on this region giving a more positive DRS effect. I believe this offers the more balanced effect with a transition phase of drag reduction from both avenues. Until further evidence presents itself the exact operation of the device is speculation but it's application is something I'm sure the other teams will be looking closely at as in a year where the grid is so close even the smallest advantage could play a large hand in the results of the latter races. McLaren have already hinted that they haven't ruled out the possibility of such a system before the end of the season. One thing is however clear that systems linked to DRS won't be prevalent in 2013 as the teams have unanimously voted to outlaw them. This will be passed to the technical working group (TWG) who will work with the FIA in order to constrain such usage by adjustment of the regulations. This however doesn't prevent the usage of the passive element of the system via the pylon being exploited.